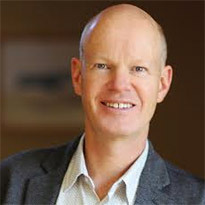 Doug Moore is responsible for building FRWD's capacity to consistently deliver its hybrid consulting-agency services to clients. He's directly involved in client work as well as helping productize and energize the agency's "small moves" method and culture. Doug joined FRWD after 12 years driving the General Mills model and brands forward, and 15 years in New York at BBDO and Saatchi & Saatchi. As for the name of the agency, Moore says, "It’s like a Rorschach thing. Some people like to use the initials because there’s DDB and BBDO and all kinds of great initials, and some people like to say Forward. So I actually say FRWD, but a lot of people say Forward and either way, it’s cool with us." Doug Moore: My role is twofold: to build the capacity of the agency so that we can grow sustainably, and to ensure we’re consistently delivering great results for our clients. That means we’re focused more on outcomes than any specific service or tactic, such as TV ads or digital offerings. Our unique approach dramatically accelerates clients' ability to grow year in and year out, and we’re very proud of that. Moore: I have three priorities. First, I’d like to build a culture where great talent comes to grow and be fulfilled. We’re a young agency with a relatively low profile, so the idea of creating a strong, positive culture here at FRWD is essential to attracting new talent and giving them an environment where they can thrive. Second, I’d like to generate undeniable awesome results for our current clients. Agencies need a certain mix of chasing new clients and focusing on client retention, and I’d say we do more of the latter. I figure, let’s create great results for current clients so they want to grow with us and stay with us long-term. Third, I’m looking to deepen the “how” of our unique consulting-agency hybrid model. John (Grudnowski) founded FRWD nine years ago with the notion that the agency-client relationship was broken and needed a dramatic change. We think that relationship is going to become much more collaborative, and we’ll be well-positioned to help our clients change and evolve alongside creating ads, media programs, etc. What are the biggest challenges facing the ad industry? Moore: The biggest challenge is understanding the challenges our clients face every day. Having been a client at General Mills for 12 years, I’ve learned that it really comes down to understanding that the pace of change externally is much faster than the pace of change internally. The marketer wants to be able to execute based on something they understand, but that’s old news. The consumer is leaping to a new app, a new platform or a new way of interacting with content every week, every month, every year, at a faster and faster rate. It’s extremely difficult to stay on top of how quickly things are changing in the digital space, but this is where eMarketer plays a huge role. Are you facing any challenges rooted in digital? Moore: Yes. I mean, digital has become such a broad topic. You still hear clients say, “We need more digital,” or “We need to shift to digital.” But what does that mean? Is it audience connection via digital channels that’s really important? Is it digital creative that we’re talking about? Is it specifically mobile? Is it programmatic? Is it one or two main things? Is it the whole thing? Moore: If all of those things are all in one big pile, then you really haven’t learned what’s the most effective approach for your client. You’ve done digital, but you may have just created just as much confusion or, ultimately, lack of momentum towards your client’s objectives. That’s where eMarketer data becomes so helpful. It helps us understand macro trends, such as media spend shifting from traditional into digital, but also the granular parts, too. Is media spend shifting towards mobile, social, programmatic or even within those, is it You Tube? Is it Instagram? Is it Facebook? Moore: We have a very talented, very curious bunch of people here, but when you’ve got hundreds of sources of information vs. one aggregator of them all, it can bog things down rather than speed things up. We love the quality of information and having a single source that cuts through all the clutter. We’re about efficiency, speed and moving our clients (and business) forward, hence the name of our agency. Where has eMarketer helped you? Moore: One super practical way in which eMarketer helps us is by providing benchmarks. Every effort that we run for our client, unless it’s a pure consulting where there’s no execution, has a scorecard. We create a report on how our campaign is performing in the marketplace. The most important thing the client usually asks is, “How are we performing relative to others?” We look to eMarketer for that kind of information: engagement rates, click-through rates, spending by category, etc. Most of our reports have some kind of a benchmark or data point that came from eMarketer. This creates confidence in our internal teams and also in the minds of our clients. We can prove we aren’t just doing better than yesterday. We’re doing better than, or as well as, an industry benchmark. What ROI does eMarketer provide to FRWD? Moore: eMarketer reduces the time it takes to find reputable information, and it also helps us all be on the same page about which data is accurate. We’re able to align on the facts; we’re not talking to our clients about fake news. This helps them understand concepts and ideas more quickly, which then creates momentum to move forward. FRWD relies on its eMarketer corporate subscription for a comprehensive view of digital marketing, media and commerce.